Digit Size 2.2" and 4"
Facility of wall hanging or hook will be provided. Industrial grade MS powder coated cabinet. 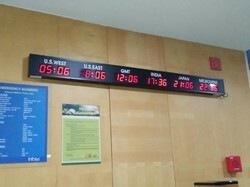 Looking for Time Zone World clocks or International clocks ?